+2, nice work, although there is quite a lot going on in that one graphic. 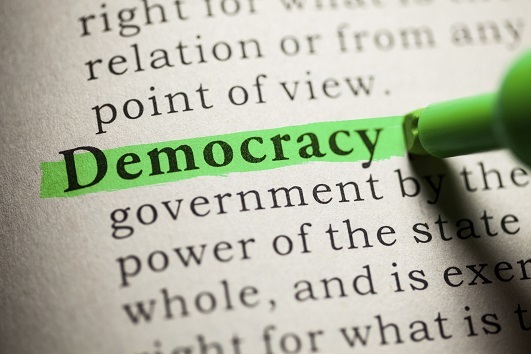 They’re going to have to continue to simplify the message to sway the nat voter, or just repeat, repeat, repeat. That doesn’t explain what the surplus is but it’s a nice detailed image about how this government screws us over. This is what explains what a Budget Surplus really is! Its not a cash surplus either as they are borrowing $8 bill this year to pay their bills ( about $1 bill of that is to refinance old borrowings). Income + 7 billion = Spending. No surplus there! Does the “taken” column include the state houses that have been sold off and the profits the Nats have taken when redeveloping state house land? And of course the sell-off of state assets (heavily discounted) has helped reduce the deficits above. Meanwhile, ironically, on the same day as the $400 million surplus is announced, we hear that Christchurch is condemned to pump sewage into its rivers for the next 30 years because the government won’t front up with the dosh to fix the system. Cost: $400 million!!! You couldn’t make it up. So far the tax cuts Key granted mostly to the better-off when he was first elected will have cost around $7 billion. About time Labour did something decent. Maybe they are taking my advice. I’d imagine this is going to get torn to shreds though. I can already spot problems. Don’t keep everyone in suspense, list all the problems you have spotted then. Michael Cullen wrote the 2008/09 budget (which was already in deficit at the Aug 2008 PREFU. 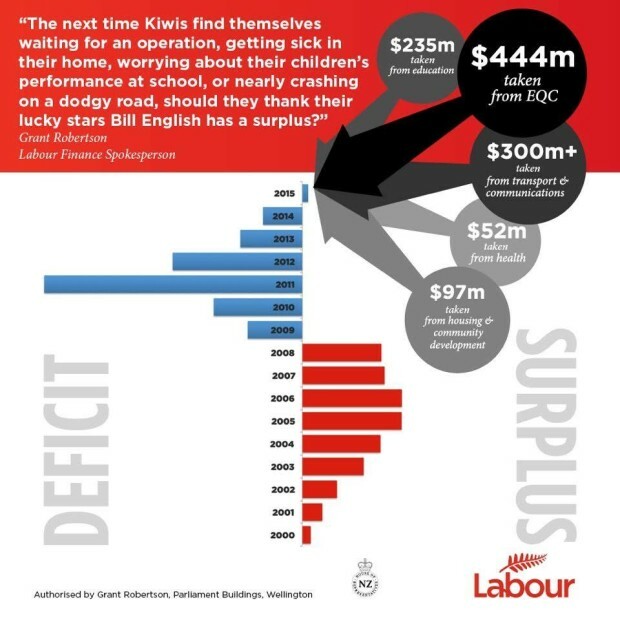 Yet this deficit is credited to National, not Labour. Here are 2 interesting responses you received. Too funny, here’s a dupe who still believes the decade of deficits lie, based on the witless conceit that Labour would simply not have responded to the GFC. Cullen’s 2008 budget predicted an OBGAL of +$1.3 billion (http://www.treasury.govt.nz/budget/2008/execsumm/b08-execsumm.pdf). According to the completely artificial promises made by Key this is all that is required. And we have been dancing on a pinhead many times on this subject. So Cullen was responsible for the GFC and not Wall Street? Neither reply addresses the point that the deficit should have been credited to Labour and not National. The deficit rightfully belongs to National and their self serving incompetence. The problem with this graphic is it’s good but hardly anyone will probably ever see it. Who cares its about time they kept it simple and repeated themes without being dragged into detail. A tactic nact use all the time. Easiest thing is to point to the EQC costs. They should be in a different shade of blue or grey, since National aren’t responsible for those costs. Then we’d clearly see just how crap they truly are, because they could no longer hide behind “earthquakes!”. Simple and effective….well done and long overdue from the party that normally takes a page when a paragraph will do. Any surplus this government claims to have is a lie. As long as there is such a big debt run up by them there is no real surplus. This is a pretty on-point message. Contrasts clearly and simply what the accounting identity (Surplus) is costing the country. Labour might want to watch which side of the line they are residing on though, maybe the deficits could start to look like a helpful way in which the government can be adding spending to the economy? Another place National is lying by numbers is the economic benefit from deep sea oil exploration drilling. They claim the recent arrival of high cost oil rigs will produce over a billion in economic benefit. Sorry, the sheeple just hear one word SURPLUS, and think “oh thats ok then”……………..
Good luck Labour trying to change that……. National has increased the national debt from ~$10 Billion to ~$100 Billion, incurring ~$4.8 Billion per annum in interest. So even if that surplus was legitimate (which it’s clearly not), it would be swallowed up by the additional interest in approx one month.